Written by a young Cardiffian, P3. So this article is a little late. I was hoping to have a response to a question I'd asked before putting this to publish but alas with the election tomorrow I feel like it's more important to send this out now. The hustings was organised byChildren In Wales on Wednesday 13th April 2016. When I arrived (which was about five mins late), I had noticed this had a different feel to the previous hustings I had been to. The room was packed. It was only made worse by the organisers asking me to sit in a spare seat right at the front, despite others standing. A nice gesture but still embarrassing nonetheless as I awkwardly made my way through. "I personally didn’t feel like all the candidates knew the different roles"
Now despite this rocky start (of which would have been avoided had I been a little more punctual), it was a great experience. It was also very surprising that the parties didn't actually spend their efforts attacking one another as I had seen before, not to say this meant there were no disagreements. The old Tory Austerity debate did make an appearance. That acted as a way to limit the obligations of the parties' proposals based on what Westminster gave them. It was interesting to see that this battle was one fought from the Tory candidate (an under 20-year-old) and the other party representatives (all markedly older). There were some interesting questions asked and I personally didn’t feel like all the candidates knew the different roles - Local Government to National. Labour’s candidate was a teacher so had some understanding of working with local government but seemed to only refer to the limited local expertise that she knew, such as the way the local schemes worked and didn’t mention how national standards could be addressed, or not in anyway that appeared memorable to myself. The Tory candidate was doing a good job despite I think his lack of knowledge in the topic, other than what he has from being a young person himself. I think this was highlighted by his attitudes from the campaign Children Are Unbeatable, which is challenging the legal defence of reasonable punishment which seems to allow some rather bad cases of physical pain to be happening to children. This is interesting given the fact that we don’t have this legal defence for domestic violence cases but we do for hitting children. The Green Party's candidate was in my opinion a bit wishy washy, she had made some very interesting statements that were positive but didn’t necessarily - in my opinion - thoroughly explain how they plan to get there. Equally the Manifesto of the Green Party doesn't really go there either, a problem that had actually caused me cancel my membership in the past. "Only one [of the candidates] had full knowledge of the areas in question"
The Liberal Democrat was interesting to listen to but he seemed to promote a very traditional view of family and I felt that this didn’t reflect the way our current society works. Though he mentioned a lot around the over-concentration on tests and grades being all that matter for young people, of which I can agree with him that they aren’t the be all and end all, but a lot of job prospects come down to that still. One thing became abundantly clear to me during this hustings. Helen Mary Jones (Plaid Cymru candidate) was the only one who had full knowledge of the areas in question. She had on numerous occasions been the one that all of the members had looked at or agreed with her points. Now it's unsure how much her advantageous position as CEO of Youth Cymru plays towards this. 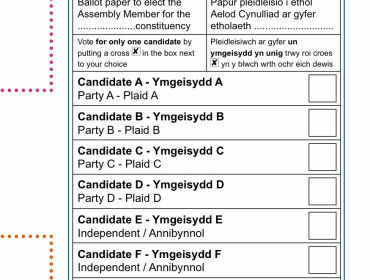 She'd made commentary that she'd be the one taking things in respect to Children and Young People forward in her party and if that's the case then I can see that Plaid Cymru may be the leading party in this area. "[They] didn’t address the issues of mental health from 18-25"
It’s a shame that there wasn’t as much time as it felt the process of the event was quite rushed but these things can be this way at times. The parties all identified the topic of mental health as being a crucial priority but didn’t address the issues of mental health from 18-25 as they all talked about CAMHS but that works up until you are 17 and 9 months. The title that a lot of Mental Health Services are for Children and Young People is really a misrepresentation. This is a time when a lot of young people who are SEET (Seeking Education, Employment or Training) are not engaged in as many things and could really be struggling. It's also at this time when suicide is a major killer for young people (men especially). The overall hustings provided me with a sense of hope, but still a great level of concern as to what may be around the corner for young people in Wales.